AN EXPOSITION OF II THESSALONIANS 2:1-12! I intend to exposit line by line from II Thessalonians 2:1 to 12 in order to make my case, and this will be the beginning sheet on each new Part until I finish it. Please review Part 1 before reading this continuing exposition of II Thessalonians 2:1-12. At times in the New Testament, the expression “that day” has a wide variety of prophetic time periods, which are determined by the context of the verses in which it is found. In these verses the context determines “that day” to mean specifically the day of the rapture. Paul advises the local church that those who are telling them that the rapture has already occurred, or is about to happen in the immediate future, are misinforming them. And he then gives then two reasons why what they have been told by these men is simply not true. The first reason is that the great “falling away” had not occurred at the time he wrote the epistle, and until it did no one could say the coming of the Lord was going to happen right away. The Greek word translated “falling away” is “apostosia,” from which our English word “apostasy” is derived. In the context of these verses, it is preceded by the definite article in the Greek text, and can only refer to “the falling away” from something, and that something represents the gospel truths of the faith once delivered to the saints. At the time Paul wrote II Thessalonians he knew the rapture was not in the immediate future, because the faith had not been delivered by the gospel to all the world of his day, as Jesus had indicated it would before the end. The faith, a system of teaching and doctrine, had to first be in place in order to have a “falling away” from it. In an attempt to justify the “first of the week” position, in very recent times, someone came up with the idea that “apostosia” meant “a catching out” of the saved at the rapture, but that is stretching the linguistic meaning of the word far beyond allowable limits. It’s a cute idea, but it just isn’t true. Well, I would say it is finally getting close to the first resurrection, because the falling away from the truth is now in full swing on a worldwide basis, just as Paul indicated in his second epistle to Timothy. The second reason he gave them that the rapture had not yet occurred, and was not in the immediate future, was that the man of sin, the antichrist, had not yet been revealed to them. The Greek word rendered “revealed” in the KJV is “apokalupto,” which means “to remove the veil or covering away from, so as to expose to open view what was before hidden, hence, to reveal, to make manifest.” The same word is used in the same epistle to refer to Christ’s visible manifestation at the time of his Second Advent. Some who hold the “first of the week” position teach we will be caught out before the antichrist is revealed to the believers, but that is simply not true. I have a suspicion that many who believe they will be caught up before the manifestation of the antichrist are going to be as surprised as an animal suddenly finding itself trapped inside a snare. They will suddenly find themselves trapped in the tribulation period with a real manifested antichrist in the Middle East. Luke 21:35 – For as a snare shall it come on all them that dwell on the face of the whole earth. Matthew 28:20 – Teaching them to observe all things whatsoever I have commanded you: and, lo, I am with you alway, even unto the end of the world. Amen. Please review Parts 1 & 2 before reading this continuing exposition of II Thessalonians 2:1-12. II Thesalonians 2:3,4 – Let no man deceive you by any means: for that day shall not come, except there come a falling away first, and that man of sin be revealed, the son of perdition;  Who opposeth and exalteth himself above all that is called God, or that is worshipped; so that he as God sitteth in the temple of God, shewing himself that he is God. The man of sin, the antichrist, the son of destruction, is described critically in verse 4. The word translated as “opposeth,” is “antikeimai.” It means “to lie opposite,” hence, to oppose, to be adverse or repugnant to another person. God is the other person in this verse, against whom all this animosity is directed. The word translated as “exalteth” is in the middle voice, meaning “to lift up one’s self over others in conceit or arrogance.” Antichrist in his own mind becomes the god of all gods, and demands that all worship be given to him alone. The word translated as “shewing” means “to point away from other objects at one specific object,” in this case he fingers himself as the only object of worship. It is almost as if he is frantic to prove it to himself as well as others. One of the first things one will notice in most Islamic countries are the countless huge pictures and statues of the current despotic leader, an effort on their part to point to themselves as “El Jumbo Supremo.” The antichrist will be pointing to himself as the supreme one of all supreme ones, and his statues and pictures will blanket the countries of the Islamic world. The examination of the phrase “he as God sitteth in the temple of God” is perhaps the most interesting part of verse 4.” It has commonly been taught this refers to a rebuilt temple of stone in Jerusalem, but I have every reason to believe this is not the kind of “temple” Paul refers to in this verse. Please bear with me in a rather lengthy discourse on this phrase, because it makes a lot of difference in other areas of prophetic interpretation. If Paul had used the Greek word “HEIRON” for temple in this verse, I would tell you immediately there was no question he was referring to a rebuilt temple in the old city of Jerusalem. But he chose to use the word NAOS for temple, and that makes it a horse of quite a different color. There are two words commonly translated as “temple” in the New Testament – HIERON and NAOS. Temple – HIERON is the word used of the Jerusalem stone temple itself and, at times, of the whole compass of the Temple Mount enclosure, including all the other subordinate buildings pertaining to the temple. Temple – NAOS is any enclosure surrounding the place where the Spirit of God dwells. In the HIERON, it was the enclosure within the HIERON where the Spirit of God dwelled, namely, the Holy of Holies in the rear of the Temple, which was separated from the Holy Place by a thick curtain. It was torn from top to bottom by the power of God when Jesus commended his Spirit into his hands. It was his completion of the redemptive work that finished the plan of salvation for all men, and tore open the barrier between the presence of God and man. It is still open to all those who will receive him as the one who finished God’s plan of salvation. The word “temple” appears some 24 times in the book of Acts, and it is ALWAYS “HIERON.” It first appears in Acts 2:46. Its last occurrence is in Acts 26:21. Acts 26:21 – For these causes the Jews caught me in the temple, and went about to kill me. The word “NAOS” does not appear in the book of Acts. Paul used the word “NAOS” eight times in all of his N.T. writings – Seven of these cases follow: See if there is any possible way you could twist these usages by Paul to refer to the stone temple in Jerusalem. I Corinthians 3:16,17 – Know ye not that ye are the TEMPLE of God, and that the Spirit of God dwelleth in you? If any man defile the TEMPLE of God, him shall God destroy; for the TEMPLE of God is holy, which temple ye are. II Corinthians 6:16 – And what agreement hath the TEMPLE of God with idols? for ye are the TEMPLE of the living God; as God hath said, I will dwell in them, and walk in them; and I will be their God, and they shall be my people. None of these usages refer to the stone Jerusalem temple. Paul did use the word HIERON for the temple located in Jerusalem in the following Scripture. I Corinthians 9:13 – Do ye not know that they which minister about holy things live of the things of the TEMPLE? and they which wait at the altar are partakers with the altar? Paul certainly knew the difference between the two words translated as TEMPLE in the New Testament, and, considering the importance of the eighth and final use of NAOS by Paul in all his writings, I don’t believe a temple will be built in Jerusalem before the 2nd Advent. II Thessalonians 2:4 – Who opposeth and EXALTETH HIMSELF above ALL that is called God, or that is worshipped; so that he as God sitteth in the TEMPLE (NAOS) of God, SHEWING HIMSELF that he is God. I believe that Paul’s usage of NAOS in II Thessalonians 2:4 carries the same meaning as Paul intended it to have in I Corinthians 6:19. I Corinthians 6:19 – What? know ye not that your body is the TEMPLE (NAOS) of the Holy Ghost which is in you, which ye have of God, and ye are not your own? II Thessalonians 2:4 – Who opposeth and EXALTETH HIMSELF above ALL that is called God, or that is worshipped; so that he as God sitteth in the TEMPLE (NAOS) of God, SHEWING HIMSELF that he is God. The antichrist will sit in a sinful body of flesh on the temple mount. I now sit in a sinful body of flesh at 204 Hickory in Dardanelle, Arkansas. My body, even though it is sinful, is a temple I received from God in the womb. The antichrist will have received the body in which he dwells by the same process, and from the same God. But inside it will dwell an evil spirit and soul, claiming to be God, and trying to prove it to mankind. Jesus was God living in a temple of sinless flesh. He was God incarnate living in a sinless body formed by God in the womb of the Virgin Mary. Jesus referred to his own body as a temple (NAOS), but the Pharisees and scribes thought he was referring to the Jerusalem temple. John 2:19-21 – Jesus answered and said unto them, Destroy this TEMPLE (NAOS), and in three days I will raise it up. Then said the Jews, Forty and six years was this temple in building, and wilt thou rear it up in three days? But he spake of the TEMPLE OF HIS BODY. John 10:30 – I and my Father are one. John 14:9 – Jesus saith unto him, Have I been so long time with you, and yet hast thou not known me, Philip? he that hath seen me hath seen the Father; and how sayest thou then, Shew us the Father? The Devil is the greatest counterfeiter in all of history. His son, the antichrist, will be a man who the world will believe has been resurrected from the dead, after having received a deadly wound by a weapon of war. Jesus was the only begotten Son of God who came in sinless flesh and lived a sinless life. The Devil will come and dwell in the body of the antichrist after he is apparently returned from the dead. When the antichrist sits on the temple mount near the end of the tribulation period, he will be Satan incarnate in sinful flesh, claiming to be God, and trying to prove it to man and himself. II Corinthians 11:13,14 – For such are false apostles, deceitful workers, TRANSFORMING THEMSELVES into the apostles of Christ. And no marvel; for Satan HIMSELF IS TRANSFORMED into an angel of light. John 5:43 – I am come in my Father’s name, and ye receive me not: if another shall come in his own name, him ye will receive. Revelation 13:3,12,14 – And I saw one of his heads as it were wounded to death; and his deadly wound was healed: and all the world wondered after the beast. And he exerciseth all the power of the first beast before him, and causeth the earth and them which dwell therein to worship the first beast, whose deadly wound was healed. And deceiveth them that dwell on the earth by the means of those miracles which he had power to do in the sight of the beast; saying to them that dwell on the earth, that they should make an image to the beast, which had the wound by a sword, and did live. The Beast was (he was alive) – is not (he died) – yet is (is resurrected)! Revelation 17:8-14 – The beast that thou sawest was, and is not; and shall ascend out of the bottomless pit, and go into perdition: and they that dwell on the earth shall wonder, whose names were not written in the book of life from the foundation of the world, when they behold the beast that was, and is not, and yet is. And here is the mind which hath wisdom. The seven heads are seven mountains, on which the woman sitteth. And there are seven kings: five are fallen, and one is, and the other is not yet come; and when he cometh, he must continue a short space. And the beast that was, and is not, even he IS the eighth, and IS OF the seven, and goeth into perdition. And the ten horns which thou sawest are ten kings, which have received no kingdom as yet; but receive power as kings one hour with the beast. These have one mind, and shall give their power and strength unto the beast. These shall make war with the Lamb, and the Lamb shall overcome them: for he is Lord of lords, and King of kings: and they that are with him are called, and chosen, and faithful. The seven mountains symbolize seven governments (kingdoms) that will all have persecuted Israel before the 2nd Advent. When John wrote Revelation, in about 96 A.D., five of the seven kingdoms, which the seven kings represent, had already persecuted Israel in the past. They were, in chronological order, the Egyptian, Assyrian, Babylonian, Persian, and Grecian Empires. The sixth, Rome, was in power at the time John was writing, and the seventh kingdom will have the antichrist as its King. However, when he is apparently resurrected from the dead, he will be Satan incarnate in human flesh and, as such, he will also be the eighth king of the seventh kingdom. The word used for “perdition” means “destruction.” And “none shall help him,” because he will be destroyed, along with the false prophet, at the end of the final battle of Armageddon by the power of Christ’s Second Advent. Isaiah 14:12-15 – How art thou fallen from heaven, O Lucifer, son of the morning! how art thou cut down to the ground, which didst weaken the nations! For thou hast said in thine heart, I will ascend into heaven, I will exalt my throne above the stars of God: I will sit also upon the mount of the congregation, in the sides of the north:  I will ascend above the heights of the clouds; I will be like the most High. Yet thou shalt be brought down to hell, to the sides of the pit. The antichrist’s claim to be God incarnate in human flesh will be the final accumulating and consolidation of the spirit of antichrist in a single man, which is the final absolute corruption of the truth of God in Christ. The antichrist’s claim represents the absolute denial that the one who came before him was the Christ, the Son of the living God. I John 2:18-22 – Little children, it is the last time: and as ye have heard that antichrist shall come, even now are there many antichrists; whereby we know that it is the last time. They went out from us, but they were not of us; for if they had been of us, they would no doubt have continued with us: but they went out, that they might be made manifest that they were not all of us. But ye have an unction from the Holy One, and ye know all things. I have not written unto you because ye know not the truth, but because ye know it, and that no lie is of the truth. Who is a liar but he that denieth that Jesus is the Christ? He is antichrist, that denieth the Father and the Son. But there is another reason that I do not believe Paul was referring to a temple of stone in Jerusalem when he used the word NAOS in II Thessalonians 2:4. The same event is found in Daniel 11:45, and what follows it, in 12:1 marks it as the latter part of the tribulation period. The word used for PALACE is APPEDEN, which is never translated as TEMPLE in the Bible. And it literally means a “fortress command post.” The word for TABERNACLES is rendered from the word OHEL, which always mean TENTS. The following scripture by Daniel paints the same event that Paul paints in II Thessalonians 2:4 – The antichrist on the temple mount as Satan incarnate sitting in human flesh, between the Mediterranean and Dead Seas, with the countless tents of his great army poised to strike a final death-blow against Israel in the Negev – waiting for his command that will begin the battle of Armageddon. But in spite of his multi million army of flesh, none shall be able to help him, because he is about to be zapped by the direct power of God in his creation. Daniel 11:45 to 12:1 – And he shall plant the tabernacles of his PALACE (APPEDEN) between the seas in the glorious holy mountain; yet he shall come to his end, and none shall help him. And at that time shall Michael stand up the great prince which standeth for the children of thy people: and there shall be a time of trouble, such as never was since there was a nation even to that same time: and at that time thy people shall be delivered, every one that shall be found written in the book. Matthew 24:29,30 – Immediately after the tribulation of those days shall the sun be darkened, and the moon shall not give her light, and the stars shall fall from heaven, and the powers of the heavens shall be shaken:  And then shall appear the sign of the Son of man in heaven: and then shall all the tribes of the earth mourn, and they shall see the Son of man coming in the clouds of heaven with power and great glory. Acts 20:28 – Take heed therefore unto yourselves, and to all the flock, over the which the Holy Ghost hath made you overseers, to FEED the church of God, which he hath purchased with his own blood. Matthew 24:44-47 – Therefore be ye also ready: for in such an hour as ye think not the Son of man cometh. Who then is a faithful and wise servant, whom his lord hath made ruler over his household, to give them MEAT in due season? Blessed is that servant, whom his lord when he cometh shall find so doing. Verily I say unto you, That he shall make him ruler over ALL his goods. The real question that a member of one of the Lord’s churches should be asking is this – How much of the inheritance do I want to inherit? Or, to put it another way – How close to God will you live in heaven? God has concluded ALL of Israel in unbelief, and while the words “they” and “them” in I Thessalonians 5:3 can be used to apply to all unbelievers, it is, in context, specifically referring to the nation of Israel. Romans 11:32 – For God hath concluded THEM all in unbelief, that he might have mercy upon all. I Thessalonians 5:3-6 – For when THEY shall say, Peace and safety; then sudden destruction cometh upon THEM, as travail upon a woman with child; and THEY shall not escape. But ye, brethren, are not in darkness, that that day should overtake you as a thief. Ye are all the children of light, and the children of the day: we are not of the night, nor of darkness. Therefore let us not sleep, as do others; but let us watch and be sober. Should atheists, agnostics, or anyone read the book of Revelation? Yes! But the book is written to churches. And the primary applications of the writings are directed to church members. Church members, who will not swallow the MEAT of the word by applying it to their lives, are defiling their garments, which represent their visible, everyday, outer lifestyle testimony to the world. And they are going to live about as close to Jesus in his heavenly kingdom as they lived to him in this present life. Revelation 3:3,4 – Remember therefore how thou hast received and heard, and hold fast, and repent. If therefore thou shalt not watch, I will come on thee as a thief, and thou shalt not know what hour I will come upon thee. Thou hast a few names even in Sardis which have not defiled their garments; and they shall walk with me in white: for they are worthy. “Quickly” is an adverbial modifier used as a descriptive adjective. It is referring the manner of his coming, not the time or nearness of it. His coming for the saved will be as quick as the blinking of an eye. Please review Parts 1 to 3 before reading this continuing exposition of II Thessalonians 2:1-12. II Thessalonians 2:3-5 – Let no man deceive you by any means: for that day shall not come, except there come a falling away first, and that man of sin be revealed, the son of perdition;  Who opposeth and exalteth himself above all that is called God, or that is worshipped; so that he as God sitteth in the temple of God, shewing himself that he is God. Remember ye not, that, when I was yet with you, I told you these things? Verse 5 is the keynote of this exposition of verses 1 to 12 in this exposition of II Thessalonians 2, because it tells us that Paul had already given them the details when he was previously with them. He was simply reminding them of what he had already taught them. It would have been nice to have had a bug planted on the wall to have what he taught them on a recording. But we do have his first epistle to them, and some ideas can be gleaned as to what he taught them about some of the events which would occur shortly before the rapture. I Thessalonians 5:1 – But of the times and the seasons, brethren, ye have no need that I write unto you. They did not have any need for him to tell them again because he had told them before, and they should have a perfect understanding of the times and seasons which would be occurring before the rapture. II Thessalonians 2:5 – Remember ye not, that, when I was yet with you, I told you these things? Acts 1:7 – And he said unto them, It is not for you to know the times or the seasons, which the Father hath put in his own power. “The times” refers to the phases of the moon upon which the Hebrew calendar was based, and the sighting of the new moon began many of the Hebrew festivals. It simply means one cannot tell the month of the year the rapture will occur. “The seasons” refers to much the same as the Gentile calendar, that is, summer, winter, spring, and fall. It simply means we cannot tell whether the rapture will occur in summer, winter, spring, or fall. In Matthew 24:36, Jesus makes it quite clear one cannot tell the day or the hour. Matthew 24:36 – But of that day and hour knoweth no man, no, not the angels of heaven, but my Father only. So, what do all these Scriptures combined tell us what we cannot know about the time of the rapture – we are not able to tell the hour, the day, the week, the month or which one of the four seasons in which it will occur – and, by inference, we cannot know the year. But it does tell us we can know when it is near, because we know what events are prophesied to occur shortly before it happens, and it tells us why that is possible – because we are not the children of darkness – we are the children of light – and the day of the rapture should not catch us completely by surprise, as would be the case if a thief came into our home while we slept. I Thessalonians 5:1-5 – But of the times and the seasons, brethren, ye have no need that I write unto you. For yourselves know perfectly that the day of the Lord so cometh as a thief in the night. For when they shall say, Peace and safety; then sudden destruction cometh upon them, as travail upon a woman with child; and they shall not escape. But ye, brethren, are not in darkness, that that day should overtake you as a thief. Ye are all the children of light, and the children of the day: we are not of the night, nor of darkness. When we see Israel heading into a time when they think they have attained a peace with safety, then one can know her time of travail, the tribulation period, is about to begin, and that the rapture is not in the far distant future. II Thessalonians 2:5,6 – Remember ye not, that, when I was yet with you, I told you these things? And now ye know what withholdeth that he might be revealed in his time. The he is the antichrist and the subject addressed begs a question – why has he not already revealed himself? In our next Update in this series, we will discuss what has been withholding him from revealing himself. The answer is found in verse 7. We know that the spirit of antichrist was already in the world when Paul wrote the epistle, but Israel was hardly having a time of “peace and safety” when he wrote it, and have not had such a status up to this day. The spirit of antichrist was being held back from being manifested as a flesh and blood man, and he will not be revealed until Israel believes it has achieved a condition of “peace and safety” – one which it will be able to control and maintain by its own power and expertise. I John 4:3-6 – And every spirit that confesseth not that Jesus Christ is come in the flesh is not of God: and this is that spirit of antichrist, whereof ye have heard that it should come; and even now already is it in the world. Ye are of God, little children, and have overcome them: because greater is he that is in you, than he that is in the world. They are of the world: therefore speak they of the world, and the world heareth them. We are of God: he that knoweth God heareth us; he that is not of God heareth not us. Hereby know we the spirit of truth, and the spirit of error. The following information and links are being placed on most of the new pages on my Websites, in order to help you become aware of the impending Great Tribulation Period, the Wrath of God and the beginning of the Millennial Reign. Here are some Videos of Excellent Quality regarding the Piton de la Fournaise Volcano, which is French for “Peak of the Furnace”. During the Great Tribulation and more so, during the last portion of this time period, known as the Wrath of God, there will literally be a massive number of Volcanic Eruptions surrounding the surface of the Earth that will be occurring similar to this type of Eruption. Here are some links to more information about Volcanoes in order to help you understand how they will overwhelm humanity during the Great Tribulation Period and most assuredly during the Wrath of God, which will come upon the Wicked of the World. Check out these links for information about the Oort Cloud and the Kuiper Belt This is the location of trillions of comets. Eventually, one of them will hit the earth!!! It might be a “Super Comet.” Just type the words: Super Comet in the search section on the Internet and you should find some information. For a better understanding of the word “hail, as mentioned in Revelation 8:7; 11:15-19 and 16:17-21, just do some research on the words: Volcanic Bomb. The Following Are Some Excellent Websites. This next section deals with the Destruction of Rome, Italy and the Vatican City. Be sure to check out these Videos on my Website. Some of the information are pictures and there are some truly amazing live Volcanic Eruptions. Along with the pages above, you can check out these four pages numbered below that have many Videos that show a greater degree of the Earthquake and Volcanic activities on a global scale, along with additional studies related to this End of the World theology. Here are some amazing Videos. Hope they will enrich your life. I will add some more as time permits. There are many projects that keep me busy. At least I’m busy about the Lord’s work. But it is certainly worth considering… There are other volcanoes in the area, as the whole country is above a Subduction Zone. You may not want to accept this concept, but it will happen. The Bible clearly teaches this fact. It Will Happen… Again, It Will Happen… It’s just a matter of time. Please check out these sixteen links. They will provide you with information as to the method of the destruction used against the City of Rome and primarily for the single purpose of destroying the religious system in the Vatican City. Destroy them which destroy the earth. (To bring to ruin) them which (morally corrupt) the earth. Revelation 11:18b. And the angel thrust with intense violence, his gathering hook and sickle for harvesting, into the earth and gathered the vine and vintage of the earth and cast and threw it into the great trough, wine-vat and winepress of the fierce indignation and wrath of Deity; the very exceeding great God. And the great trough, wine-vat and winepress was trodden without the city and a blood-like substance came out of the winepress, even up to the horse bridle-bits, by the space of a thousand and six hundred furlongs. (1,600 furlongs times, 606.75 Greek feet, divided by 5,280 English feet, equals 183.86 miles). Revelation 14:19-20. If you really want to see how God will use the earth to bring about The Great Tribulation Period; just watch some of these videos. Listen to the roaring thunder of the Volcanic Eruption and watch the lava flow across the earth’s surface. Watch the volcanic bombs or hail, as mentioned in the Bible, falling from the air, during the eruption. You can also watch other videos on the Internet about: Earthquakes, Tsunamis, Volcanic Lightning, Volcano Lava, Submarine Volcano, etc. Just enter any of these subjects in the Video Section of an Internet Search. What about the “the sea and the waves roaring;”? Can we find any insight as to what the Lord was talking about? And from Jesus Christ, who is the faithful witness and the first begotten of the dead and the prince of the kings of the earth. Unto him that loved us and washed us from our sins in his own blood and hath made us kings and priests unto God and his Father; to him be glory and dominion forever and ever. Amen. Behold,he cometh with clouds; and every eye shall see him and they also which pierced him: and all kindred’s of the earth shall wail because of him. Even so, Amen. I am Alpha and Omega, the beginning and the ending, saith the Lord, which is and which was and which is to come, the Almighty. Revelation 1:5-8. Check out these links for information about Volcanic Ash Clouds. Volcanic Ash Glossary – Description. Volcanic Ash Glossary – Images. And the seventh angel sounded; and there were great voices in heaven, saying, The kingdoms of this world are become the kingdoms of our Lord and of his Christ;and he shall reign forever and ever. And the four and twenty elders, which sat before God on their seats, fell upon their faces and worshipped God, Saying, We give thee thanks, O Lord God Almighty, which art, and wast, and art to come; because thou hast taken to thee thy great power and hast reigned. And the nations were angry and thy wrath is come and the time of the dead, that they should be judged and that thou shouldest give rewards unto thy servants the prophets and to the saints and them that fear thy name, small and great; and shouldest destroy them, which destroy the earth. And the temple of God was opened in heaven and there was seen in his temple the ark of his testament; and there were lightnings and voices and thunderings and an earthquake and great hail. Revelation11:15-19. 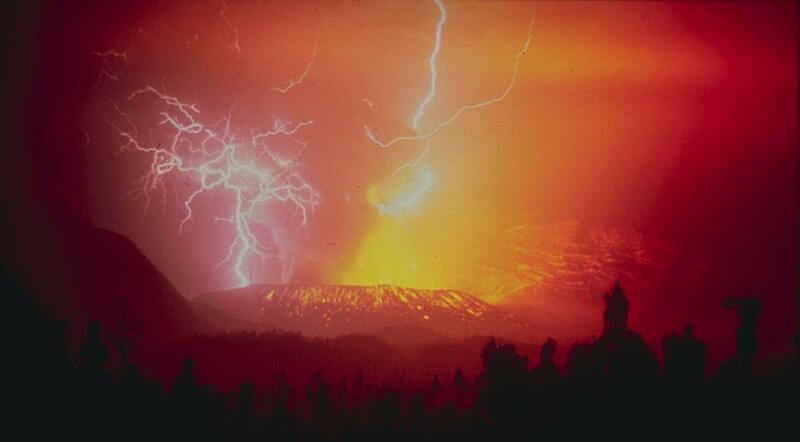 Check out these links for information about Volcanic Lightning and Volcanic Hail. Volcanic Lightning from the Rinjani Volcano. Volcanic Lightning from the Galunggung Volcano. Volcanic Lightning from the Chaiten Volcano. The seventh vial of wrath ends the Tribulation Period. When the last 45 days of the Wrath of God is completed, there would have been great worldwide earthquakes, massive volcanic eruptions, with towering ash clouds, volcanic lightning and volcanic bombs of melting rock. 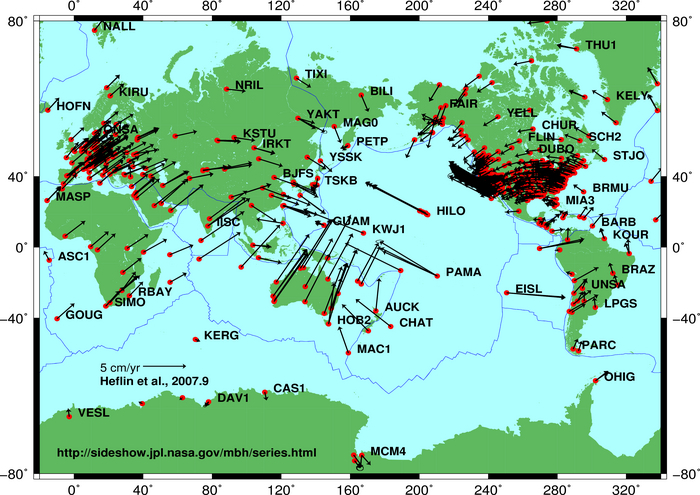 These submarine earthquakes and volcanoes will produce catastrophic tsunamis waves along the coastal areas, resulting in a displacement of the geographical location of all the islands and mountains on this earth. Every inch of landmass on the entire surface of the earth will have a new geographical position. God will judge the people of the world with fire from under the earth’s crust. And the seventh angel poured out his vial into the air; and there came a great voice out of the temple of heaven, from the throne, saying, It is done. And there were voices and thunders and lightnings; and there was a great earthquake, such as not since men were upon the earth, so mighty an earthquake and so great. And the city was divided into three parts and the cities of the nations fell: and great Babylon came in remembrance before God, to give unto her the cup of the wine of the fierceness of his wrath. And every island fled away and the mountains were not found. And there fell upon men a great hail out of heaven, every stone about the weight of a talent: and men blasphemed God because of the plague of the hail; for the plague thereof was exceeding great. Revelation 16:17-21. Check out these links for information on how God will use the earth to bring about the Great Tribulation Period. God will cause the tectonic plate movement to produce earthquakes and volcanic eruptions, bring an end to the present state of humanity. It will be the End of the World as we know it, in our life time. 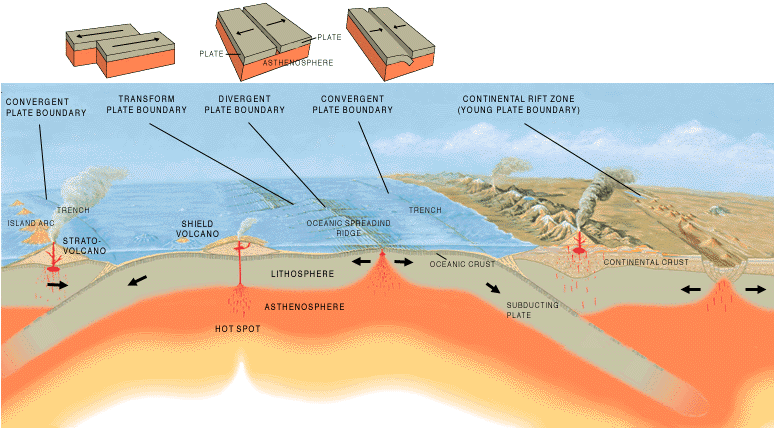 Ring of Fire from USGS. List of Volcano Maps from USGS. Check out these two links below, to understand “Lightning Fire”. Revelation 8:  And I beheld, and heard an angel flying through the midst of heaven, saying with a loud voice, Woe, woe, woe, to the inhabiters of the earth by reason of the other voices of the trumpet of the three angels, which are yet to sound! To better answer how to answer this question, we should learn something about the structure of the land in the area of the Euphrates River. The following links will help towards understanding how God will use earthquakes, to break up the land in the Middle East, to divert the Euphrates River. Check out these images for the location of the Euphrates River. Notice it’s headwaters, then how it flows southeast. During the Great Tribulation Period, the earthquakes will cause it to be diverted southwest into the Jordan River. The land of Syria has many earthquake faults and a massive earthquake will collapse the Palmyride folds, which will allow the Euphrates River to flow southwest towards Israel. These geological changes will begin, when the Antichrist or the Islamic leader of the ten Arab confederation of nations attack the nation of Israel. When the Euphrates River, the Jordan River and Ezekiel’s spring combine their water sources, in addition to hundreds, perhaps thousands of newly formed springs, along with the transformation of the southern end of the Dead Sea Fault Zone, the “New River” will be able to support an abundance of freshwater fish for the 1,000 years in which Israel will become the breadbasket of the world. For the Gentile nations, the heathen and pagan people, will rise and move up against and among one another bordering nations and kingdom against kingdom, one place of reign touching another; and there shall be famines, a lack of food, causing destitution for people being without food; and pestilences, a plague of diseases; and a shaking of the ground, causing it to tremble, shake sideways, back and forth, for the earth will be shaking in divers or various places, down through its’ distribution with intensity, in many locations. But all these are the beginning, of the grief, the first of the troubles, sorrows, of the birth pains and travail. Matthew 24:7-8. The Lord Jesus Christ will Return at the end of The Great Tribulation Period, in a single massive cloud of “Volcanic Ash,” which will encircle the entire planet earth. It will be caused by the thousands of erupting volcanoes and perhaps in addition to some “Super Volcanoes.” It will take several years to build this cloud, in which the Lord will pass through, upon His return to the earth. Check out these links, for more information about this plague of the hail. Hope the above Links will be of help to you in understanding how and what will be the method in which God will be using the Earth to bring about the Great Tribulation Period; ending with the Wrath of God and the beginning of the Millennial Reign… For more information, be sure to check out some of the following links…. The following are Links to all of the Pages on my other Website. These Links are Pages that are on the Welcome/front page of the other Website. I cannot edit them any longer, as the Software that the site was built, began to fail and I could not get the Hosting Service or Developer to fix the issue, so I switched to Word Press. A CLERIC WHO KNOWS HOW TO CONTRADICT THE KORAN! Anointed, Cut-off, and Not Yet Accepted as King! Before the Battle of Armageddon Occurs! God’s Word, the Lamb, Becomes His Lion of Judah! How Can One Look Forward to Luke 21:25,26? The King of the South Pushes Against the King of the North! Was it a Star as We Understand Stars in the Heavens? What is the name of the Antichrist that will total 666? Why Not Wait and Let the God of Israel do it? Here are some Links to the Volcano Discovery YouTube site, which shows many amazing Videos about different Volcanic Eruptions. Here are some Links to some YouTube Videos that deal with the events related to the Beginning of Sorrows of the New Testament. These types of events are going to get worse in the years ahead, as the Great Tribulation Period approaches. This time period will last for 3 1/2 years, then at the very end of this Time Period, the Wrath of God will take place and last for about 45 days. These Videos are mostly Volcanic Eruption events, as these are the primary events that will be occurring during this Great Tribulation Period. This first section are what I consider to be the Best Volcanic Videos as they show a lot of the Volcanic Bombs, Fire, Lava and some Ash Cloud eruptions that is described in the Book of Revelation. Most people of the world will have no idea what is occurring on a global scene, because they are have no knowledge of the Bible and are not being taught the Book of Revelation by religious leaders. The truth is, most religious leaders are totally ignorant of these things anyway, so how can they be expected to teach anyone else??? These Videos are mostly Earthquake or Volcanic Eruption events, as these are the primary events that will be occurring during this Great Tribulation Period. Some of these Sites have other items on them, but there are some Earthquake or Volcano Videos to view, as that is the objective of this page. The following are links to a YouTube site that has some Excellent volcanic videos. These Sermons are from Pastor Tom McElmurry at Dardanelle Missionary Baptist Church at Dardanelle, Arkansas. Tom McElmurry is a pastor who holds University, Seminary, and Institutional degrees in Physical Science, Theology, and Divinity. He was certified as a Meteorologist in 1954 by the United States Air Force; became a member of the American Meteorological Society in 1962; served in the Mid-eastern, African, European, and Far-Eastern Theaters as a Meteorologist; and is a member of the Israel Geological Society. He worked as a tornado forecaster in the Kansas City Severe Weather Service, and as an analyst for the National Security Agency, retiring from the USAF-NSA in 1971. He has taught Physics, Chemistry, Physical Science, Biology, and Earth Science in the public school system as a certified teacher, and has written three books: Tectonic Chaos, Tribulation Triad, and Tribulation Birth Pangs from the Bottomless Pit. He has also written scientific articles published by the USAF and the Bulletin of the American Meteorological Society. His wife and family reside in Dardanelle, Arkansas, where he has pastored since 1974. His military and civilian education includes 2,730 clock hours of meteorological instruction in USAF selected institutions of higher learning, and more than 265 University and Seminary hours in undergraduate and graduate studies. He has lectured worldwide in 20 Missionary Baptist colleges and seminaries,and in more than 600 Missionary Baptist Churches in Lithuania, Romania, Africa, and the U.S.A. He is a distinguished graduate of the USAFMAC Military Academy. He has a weekly short wave broadcast on Saturday by Middle East Bible Voice on a frequency of 13.710 MHz at 1930 UTC. It can be heard in Israel at 9:30 P.M. local time and in Iraq at 11:30 P.M. local time. It is heard in Israel, Lebanon, Cyprus, Syria, Jordan, Turkey, Iran, Iraq, Saudi Arabia, Kuwait, Yemen, Oman, Afghanistan, Pakistan, Armenia, Turkmenistan, and Qatar. This page has some Audio Bible Sermons that deal mostly with the Great Tribulation Period. The Sermons are related to the events as to description of how and why they are occurring. Be sure to take time and listen to the Sermons, as this will help you understand what this Time Period is all about.